By now, most of us have become pretty used to the ways that technology — both devices and social web services — have changed things we have always taken for granted, whether it’s communication or photography, or something as obvious as renting an apartment or hailing a cab. But those same kinds of disruptions are moving into new areas, and education is one of them. From university classes via YouTube and startups like Udacity to the One Laptop Per Child (OLPC) project, there are more ways than ever for children to educate themselves, even in remote villages in Ethiopia. Despite the inevitable criticisms such efforts get both from within the education system and outside it, it’s part of a powerful and growing phenomenon. One example: At a recent conference on emerging technology at MIT, Nicholas Negroponte — the former head of the MIT Media Lab and founder of the OLPC project — talked about what his group noticed about the villages in Ethiopia, where some devices were dropped off. The Motorola Xoom tablets, which were distributed along with a solar-charging system, were delivered in boxes to two isolated rural villages about 50 miles from the capital of Addis Ababa, where Negroponte said the children had never before seen printed English words — not even packaging or road signs with printed letters. Negroponte later admitted that this small test in two villages wasn’t enough to reach any hard conclusions about the success of such an effort, but, as several commenters at MIT’s Technology Review — and in a discussion at Hacker News — noted, this is not the first attempt to do such a thing: Dr. Sugata Mitra, a professor of educational technology at Newcastle University, launched a project called the “Hole In The Wall” in 1999 in the slums of New Delhi that provided a single computer to children nearby. With little instruction and no formal background in computers, they were able to learn a surprising amount. 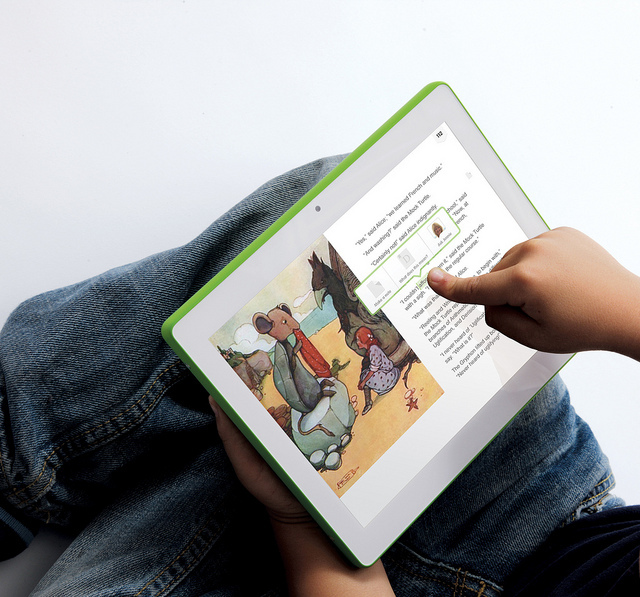 In fact, Mitra’s experiences were one of the inspirations for the OLPC approach in Ethiopia, according to OLPC’s chief technology officer Ed McNierney. And, while the experiment has drawn a fair degree of criticism on a number of fronts — from those who believe the money for such projects should go towards teachers and schools instead of laptops, or from those who question whether OLPC can scale large enough to make a difference — Pando Daily founder Sarah Lacy says that she has seen laptops in use in places like Colombia and Rwanda, and they have changed lives for the better. A second example of how a seemingly innocuous technology like YouTube — especially when combined with a social network — can change lives comes from Time magazine, which wrote recently about an 11-year-old girl in Pakistan who was taking an introductory university-level physics class through an educational startup called Udacity. Unfortunately, just as Khadijah Niazi was about to complete the final exam for the course (along with 23,000 other people), her country’s government cut off access to YouTube, which Udacity uses to distribute short instructional clips. Udacity and the OLPC project are only two of the many startups and other ventures that are trying to change the way education occurs — not just in North America, but everywhere. There is also the Khan Academy, which started with Salman Khan using YouTube videos as a way of teaching his young niece about mathematics and now has delivered more than 200 million individual lessons. And there is Coursera, which is designed to allow any educational institution to offer online instruction. Although the latter ran into a brief regulatory roadblock in Minnesota, there are signs that these kinds of innovative efforts are being accepted: Udacity courses are now being approved for credit by some universities, including one in Colorado. Whether it’s moribund educational institutions or governments or just bureaucratic red tape, what examples like these show is that the disruption of education continues whether such entities like it or not. Students will find a way to learn if they are given the opportunity, and technology and the social web are providing some powerful ways of doing that. Esto es una evidencia que es posible una educaciÃ³n de calidad para todos(as). Gracias. Technology is remarkably emerging as an important component of recent reforms in educational systems world-wide. Macro-implementation decisions have paved the way for the implementation of technology in education and training and instructions about planning for technology have already made their way to so many guidelines and programs. The new technology is continuously being promoted as a quite efficient tool for improving learning and teaching. Children often find ways around the government. Find the fall guy. More detail would have been nice. Did the Ethiopian children already know how to read and write in Swahili or Arabic (or whatever is the primary language in the area)? Or did they teach themselves to read English using the tablets, assisted by the learning apps, without prior literacy in any language? Might anyone know more about this? Pando Daily’s Sarah Lacy says that laptops changed life for the better in Columbia. Hmm… Columbia is a country of extremes, but even 30 years ago, there were students from Columbia, schooled there, that attended and graduated with comp sci and engineering degrees from Stanford and MIT. All of Columbia is not a primitive backwater. The example of the Pakistani young lady, and her widely (though not so remotely) dispersed classmates, and their experience with the physics class, was great. That is how distance and online learning could be especially helpful, rather than in the USA, where all sorts of resources are readily available. Notice who saved the day when internet access was cut off to Pakistan by local government (according to the post): A physics professor in Portugal! She was almost certainly taught in one of those educational institutions that the last paragraph of this post so blithely dismissed as moribund and archaic. Physics professors, whether from Portugal or Minnesota, are still very important…as are regulations for universities, and accreditation. L’utilisation des nouvelles technologies permettent une modification des mÃ©thodes d’apprentissages. Le e-learning rend les jeunes plus autonomes et facilite l’intÃ©gration de nouvelles informations. Our educators could have created a National Recommended Reading List long before we had cheap computers. When do they even discuss such a thing today? I don’t know if you refer to the U.S.A. or elsewhere, but I can only speak of what I know. Our educators DID create recommended reading lists, with minor variations for demography. They created, and adjusted such lists continuously over the past 100 years, through use of standardized reading curricula in public (and parochial) schools, from middle school “language arts”, to American, English and world literature for 9th to 12th grade students. 16 year old’s still read, discuss and write essays about Nathaniel Hawthorne’s “Scarlet Letter”, and “The Odyssey” and George Orwell books and more. I don’t follow your reasoning at all, as to why there is insufficient appropriate material for educational purposes, and I especially don’t understand how “Mysterious-Strange-Weird Index of Sensational Mysteries” etc. that you listed is relevant to this post, which is about how tablet devices and internet usage provided increased access to knowledge to young people in geographically (and technologically) remote areas. Is this the laptop/tablet that my kids will never see, because they charge double for it in the U.S., while giving it away elsewhere in the world? These days, technology also provides kids who are struggling with traditional schooling with great new opportunities to catch up with material or enhance their education. Definitely part of the thinking behind great new apps like StraightAce.com, a math app that helps middle schoolers learn 6th-8th grade math with virtual supervision from parents. There is a great website for apps, http://www.educationalappstore.com, which specialises in educational apps for young kids, parents, students and teachers. So curious that there is not much description of the software loaded on the device. The only mention of the word is their hacking the software. Our grade schools are designed to kill curiosity and make children obedient not exploit their curiosity to serve education. Of course if this practice becomes common then it is a threat to what we currently call CULTURE.